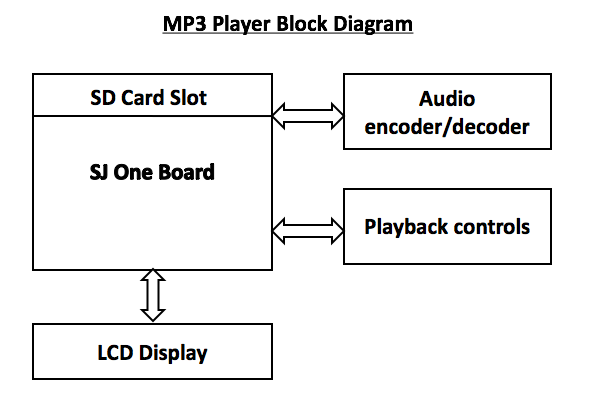 The goal of this project is to create a fully functional MP3 music player using SJOne Microcontroller board as the source for music and control. MP3 files will be present on an SD card. SJOne board reads these files and transfers data to a audio decoding peripheral for generating music. User would be able to use player controls (start/stop/pause) for playing MP3 songs and view the track information on a display. Audio should not sound slower or faster when running on your system. User should be able to figure out how to use the device without a user manual. Product must be packaged in some enclosure. No wires can be vision for the project. System must use the SJOne on board SD card to read MP3 audio files. System software must be thread safe always. System software must use OS structures and primitives where applicable. Use of any external libraries (specifically Arduino) that drive the hardware you intent to use. You must make the drivers from scratch for every part you make. You may use the internal buttons for controlling the MP3 player. You may use the 7-segment display and LEDs above buttons for debugging but not as the main menu.